Apple (AAPL) on Tuesday introduced two new iPhones, its long-awaited Apple Watch and a mobile payment system as part of a marketing blitz aimed at drumming up consumer excitement. Now the question is whether the new gear will live up to the hype. Speaking from the Flint Performing Arts Center in Apple's hometown of Cupertino, Calif., Apple marketing chief Philip Schiller kept the audience waiting beyond the event's scheduled 1 p.m. ET start, a fitting delay for a company that has kept its fans waiting for a new product. 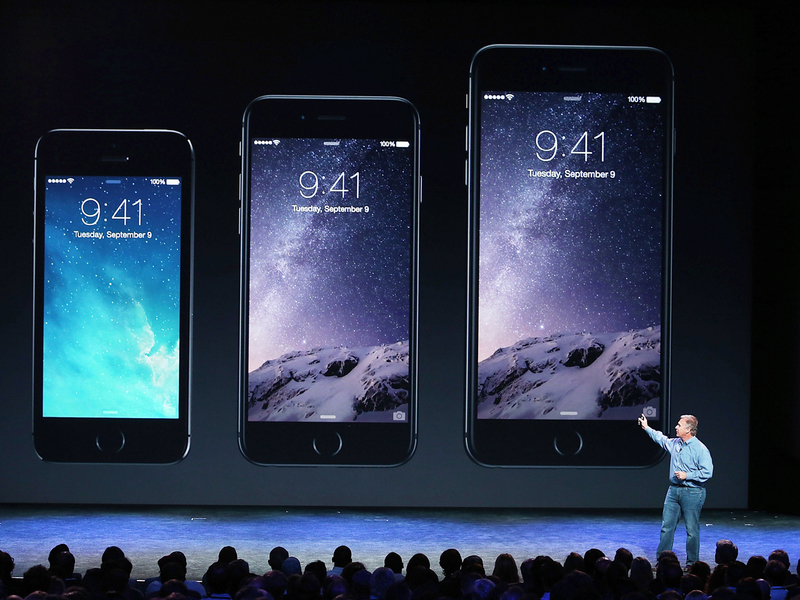 The base model comes with a 4.7-inch screen and the other, dubbed the iPhone 6 Plus, has a 5.5 inch-screen. The iPhone 6 screen has over 1 million pixels, while the iPhone 6 Plus has over 2 million pixels, Schiller said, emphasizing what he called the the devices' "stunning display." Gesturing toward giant photos of a lizard and a butterfly projected on-stage, Schiller also highlighted the new iPhone's enhanced camera, which he said includes image-stabilization functionality. "They're definitely targeting the more professional user and the 'phablet' user," observed CNET Editor-at-Large Tim Stevens. The technology giant has much riding on the popular reception to its new iPhone, sales of which drive most of the company's profits and which account for more than half of its revenue. But Apple's new offerings may be even more important, as the company seeks to entice customers with an expanded lineup of products and services designed to keep them within its technological ecosystem. To that end, Apple CEO Tim Cook introduced the company's new mobile payments tool, called Apple Pay, which aims to let users make purchases from their iPhone or Apple Watch. He noted that Americans make roughly 200 million payments per day, but called the process "antiquated." With Apple Pay, consumers can pay for goods without sharing credit card, address and other personal information with a merchant, Cook said. Apple Pay uses short-distance wireless technology called near-field communication, or NFC, to enable users to make purchases -- a system already built in to many Android phones. Apple has teamed with financial industry heavyweights including American Express (AXP), Mastercard (MA) and Visa (V) and says Apple Pay will work at more than 220,000 retailers nationwide. Apple has been working with companies like McDonald's, Disney, Target, Subway, and Whole Foods to integrate its service as well. Then, finally putting an end to months of rumors and speculation, Cook presented Apple's new wearable device, the Apple Watch, describing it as the "next chapter" in the company's history and a "breakthrough." "Apple Watch is the most personal device we've ever created," Cook said. "It will redefine what people expect from a watch." "However, moving into a new category is a bold, expensive and risky effort," he added in a client note. "This Apple Watch is a first-generation device, and whether it is successful or not Apple will aim to iterate and make it a must-have companion for every iPhone owner." Although Apple has posted solid financial results this year, investors and even some of the company's famously rabid fans have seemed underwhelmed by recent product launches. The last iPhones and iPads, while commercially successful, have been deemed only incremental advances -- pleasing refinements that remain well short of the big leaps forward Apple has made in the course of growing into the most valuable company in the world. That's of particular concern for a company that, under co-founder and CEO Steve Jobs, was vaunted for its design prowess and ability to discern consumer tastes even before those were fully formed. Apple is also eager to reclaim market share taken in recent years by Samsung and other makers of mobile phones based on Google's (GOOG) Android platform. Who are those people lining up for the iPhone 6? For Cook, the Apple Watch could prove either a canny move into a lucrative new product segment, or a dead end. The gadget -- which fans referred to as the Apple iWatch as rumors intensified in recent months that a device was imminent -- is the first developed entirely under Cook's leadership since he succeeded Jobs as CEO in 2011. For both Apple and other companies making smartwatches, it also represents a key test of consumer interest in a technology that to date has failed to dazzle customers. A critical challenge for Apple, experts say: Building a device that -- like the iPod, iPhone and iPad before it -- compellingly fills a need users may not know they have. No surprise, then, that Cook touted HealthKit, a software development tool that integrates health and fitness apps through the Apple Watch while giving consumers control over what health data they choose to share. Although the company could benefit from expanding into new product segments, in the short-term it remains highly dependent on rolling out devices that push the design envelope and capture the public's imagination. Indeed, until today Apple hadn't released a brand new product since launching the iPad four year ago. In the interim, Apple's competitors have stormed into a range of areas ripe for innovation, with Google working to develop driverless cars and Facebook (FB) pushing the envelope on virtual reality. That has raised concerns that, without Jobs, Apple risks losing the vision that powered its rise. Perhaps more than any tech provider, Apple is under the gun to innovate. And to be sure it is trying mightily to do that. Along with expanding into the wearable computing segment, Apple is developing Internet-enabled tools people can use to control lights, thermostats and other parts of their home. For enterprises, meanwhile, the company wants to let employers harness the power of "Big Data" from their Apple devices. Will Apple's new products silence skeptics? "A lot of other companies don't need to be as bold on a frequent basis as Apple," Soumen Ganguly, a director at consulting firm Altman Vilandrie & Co., told CNET ahead of Apple's latest commercial launch. "But people have come to expect it from Apple. They're only as good as their last great product, and we're four years away from that." A sense that Apple may be losing its bite hasn't kept investors from bidding up its shares, it's worth noting -- the company's stock has risen nearly 26 percent this year. The shares edged up $1.65, topping $100, shortly after the presentation began. If there are questions about Apple's creative mojo, it is clear from Tuesday's event that its marketing instincts remain intact. Winding up the event, Cook brought out the band U2 to play a tune and pitch the group's new album, which the executive said will be available for free download for all iTunes users.